Chosen for the first quartet of heroes are Batman, Superman, Wonder Woman and Green Lantern. The nemeses of Batman comprise the first four villains: The Joker, The Penguin, Catwoman and The Riddler. 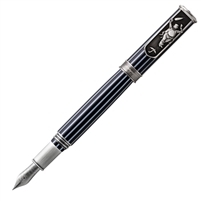 The Montegrappa DC Comics Heroes & Villains pen collection is produced under license with Warner Bros. Consumer Products, on behalf of DC Entertainment. All of the DC Comics Heroes & Villains pens are packaged in colourful boxes, and will be offered individual with dedicated display trays.